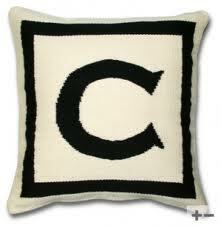 Jonathan Adler Letter Pillow Uses None-other than Copperplate Gothic Bold! Our new friends over at Jonathan Adler use Copperplate Gothic Bold in their pillow designs! These things are freaking hand made in Peru by skilled artisans who not only did one hell of a job recreating Copperplate, but took Copperplate to another level. We were unaware of Jonathan Adler until we spotted some negative words that we will not reprint here from some very snooty people on Twitter. These people are the kinds of folks who believe that Helvetica and Bickham Script are the best fonts in the world. We’re here (and Jonathan Adler here in spirit) are here to tell these folks that they better enjoy using their so called “designer” fonts because Copperplate in it’s incredible glory will outshine their fonts to the point where clients will demand Copperplate. So thank you Jonathan for choosing such a wonderful font to showcase your Peruvian artisans, you earn the Copperplate Gothic Bold award of Amazement for the week!